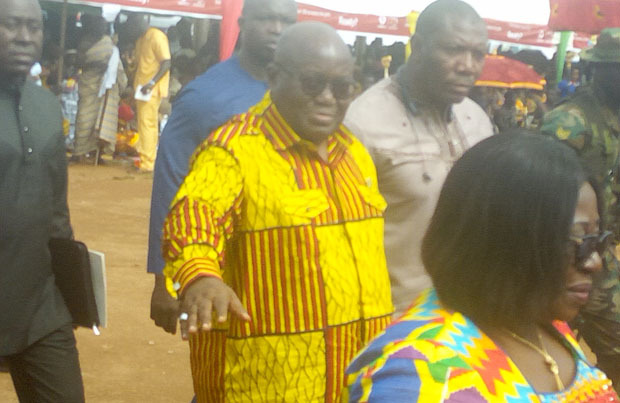 The people of the ancient town of Axim and its environs in the Western Region exuded affection for President Nana Addo Dankwa Akufo-Addo yesterday when he joined the chiefs and people of the area to celebrate their Kundum festival. The jubilation of the large crowd, including fishermen, fishmongers and traders, changed the atmosphere. The celebration was on the theme: “Promoting Security in our Communities; the Role of the Society and Traditional Authorities”. Addressing the people, President Akufo-Addo disclosed that the government would provide 40,000 housing units for the security services of which the Axim community would be a beneficiary. The president also indicated that plans were afoot for the Ghana Police Service to recruit about 4,000 personnel to help ensure effective security in the country and the remote areas in particular. “Government is also purchasing 1,000 vehicles for the Ghana Police Service and as I speak to you, 200 of them are already in the system “, the president revealed. He noted that his government would embark on rural telephony project to help open up rural communities for ICT infrastructure and to enhance education, communication and businesses in those areas. He disclosed that four farming communities in the Gwira area in the Nzema East Municipality of the Western Region had been connected to the National Grid under the current government. The communities included Gwira Eshiem, Gwira Brodiem, Gwira Wiawso and Gwira Tumentu. The president mentioned that the move was part of government’s commitment to connect some remote communities nationwide to electricity. He gave an assurance that the remaining communities in the Gwira area that had not been linked to the national grid would soon get their share. He pointed out that the initiative was part of government’s commitment to improve livelihoods in the area. He stressed that the next budget would capture the construction of the deplorable Gwira roads in the municipality. President Akufo-Addo admonished the constituents of Evalue-Ajomo-Gwira to continue to support the current government and the Member of Parliament (MP) for the area, Catherine Afeku, so that they could enjoy more developmental projects in the area. He also mentioned that plans were afoot to create a cocoa district in the Gwira area since most of the residents were cocoa farmers and also to enable them get cocoa roads. The President later cut the sod for work to commence on the Axim Sea Defence project. The project was meant to protect the ancient coastal town in the Nzema East Municipality from the ravages of the sea and also to preserve the historical and tourism sites in the area. The project stretches a distance of seven kilometres from Brawire to Apewosika in the Axim area. The sea defence project is being undertaken by Mekam Plant Hire led by its Chief Executive Officer, Atu Mould. On her part, Catherine Afeku revealed that for a long period no indigene of the area had been made a minister and was grateful to the president for making her not only a minister, but also a cabinet minister.